NOTE: Due to parking limitations at Riverside Park we will issue parking passes with the registration packages. Athletes will typically have enough passes for 1 car with 3-4 athletes. Limited overflow parking is available in the neighborhood to the east. Also, utility trailers with team tents can enter the park through the Boat Launch 2 entrance on Friday and should be left with the tent. Utility trailers arriving on Saturday should be parked north of the footbridge via the Boat Launch 3 entrance. The Grand Valley Mens Varsity 8+ Won a Nation Poll for Crew of the week after a rigorous couple days of voting on row2k (www.row2k.com). Voting ended Thursday April 19th at 5:00 P.M. EST with voting that came all the way to the wire. The result was a draw, with a statistical tie between Bryn Mawr Women’s Varsity 4+ and the Laker Navy’s Mens Varsity 8+. Thanks to your vote and those of the Laker Family, the Laker Navy Won a top Honor of National Crew of the Week. This is a testament to the hard work and dedication of the Entire Laker Navy. This honors coming as the Grand Valley Rowing Team is heading to Oak Ridge, TN for the Southern Intercollegiate Rowing Association Championships (SIRA).The 2012 SIRA Championship Regatta will be held on April 21-22 as Laker Navy looks to continue their success and get great racing in this weekend. Keep pulling for the Laker Navy and Check back here often for the latest news and results. 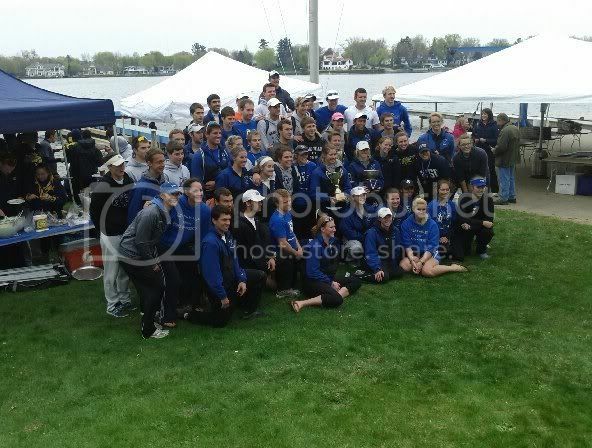 The 17th Annual Lubbers Cup Regatta was an all around success for the Grand Valley Lakers. Having great racing at the Spring Lake venue gives athletes, parents, and alumni a chance to showcase some speed and that is exactly what the GVSU crew did. The women’s team claimed the Women’s points trophy by a landslide as they claimed victories in the Women’s Novice 8+, Women’s 2V 8+, Women’s Novice 4+, Women’s Varsity 8+, and the Women’s 2V/ Lightweight 4+. The Grand Valley Men took second in the Men’s points trophy behind the University of Michigan Men by one point. The GVSU men’s team had a very promising showing as they took 1st place in the Men’s Varsity 8+, Men’s Novice 8+, Men’s 3V 4+, and the Men’s Varsity 4+. From a senior’s perspective, this is the fastest that I have seen the Grand Valley Crew as a whole. The Women are yet again at Dad Vail medal speed and have fantastic depth. There are going to be challenges ahead for the women but I truly believe that once they hit Philadelphia, there is a heck of a chance that they will be leaving with hardware around their necks. Dad Vail National Championship Regatta. It is a weird feeling to see an ENTIRE crew do so well, so early in the season. I personally have never had so much pride when saying that I am apart of the GVSU crew. Standing on the awards stage with the Men’s V8+ and being able to take a picture with my arm around Don Lubbers is going to be a an unforgettable memory. However, I know that there is work to do and speed to gain and only a month to do it. Coach Bancheri is going to kick our butts in the coming weeks because for the rest of the season people are will be coming after Grand Valley. Podcast will be out within half hour of the show .